Now you can address your skin’s concerns with the power and speed of laser and Intense Pulsed Light (IPL). A laser treatment delivers a direct beam of energy to one specific targeted area. An IPL treatment consists of a series of high-intensity pulses of broad spectrum light. Both procedures can provide dramatic results. Using a consultative approach, our laser and IPL experts determine which treatment best addresses your problematic areas to reveal a healthier looking you. Laser treatments and IPL treatments can address and correct a wide range of aesthetic problems as well as provide a first line of defense for those seeking to slow down the natural aging process. Treatments can be performed on the face and other parts of the body. These procedures can address conditions ranging from sun damage, age spots, acne scarring, wrinkles, undesired pigmentation, skin redness, and natural aging. Laser treatments and IPL treatments are quick, effective methods for treating skin. Non-invasive alternatives to cosmetic surgery, laser treatments and IPL treatments offer noticeable improvement. Using this photothermal energy, cells in the upper layers of the skin are stimulated causing regeneration. As a result, Fotofacial can take years off the face, neck, hands or almost any other part of the body. Fotofacial often requires fewer treatments to achieve visible results than other light-based therapy devices. Your skin will appear smoother, more vibrant and more even. SkinTyte’s firming process improves the appearance of sagging skin. Safe for all skin types, it can be used to tighten, firm and lift the face, hands and/or other parts of the body. SkinTyte uses infrared light to heat dermal collagen and promotes the body’s natural healing process. With its cutting edge technology, SkinTyte is simultaneously able to protect the epidermal layer of skin with its cooling action. Because SkinTyte uses rapid, gentle energy pulses, it requires no topical anesthetic. An alternative to expensive creams and harsh medicines, the Forever Clear BBL destroys acne-causing bacteria, reduces inflammation and redness, and provides the right conditions for healthy looking skin. With a 3-step acne treatment, this broadband light (BBL) begins by delivering blue light to attack bacteria. Yellow light reduces inflammation, prevents new breakouts and minimizes scars. Infrared light jumpstarts the healing process and enhances the benefits of the first two steps. Forever Clear BBL can address acne on the face, neck, back and most areas of the body. Delivering pulses of light, the Forever Bare BBL™ protects skin and raises follicle temperature to remove unwanted hair. It also provides continuous cooling to skin before, during and after hair removal, making it safe and comfortable. Forever Bare BBL addresses both large and small areas with precision and ease. MicroLaserPeel® removes a very thin layer of skin and can revitalize your skin’s surface and reveal a more vibrant appearance. The MicroLaserPeel is recommended for fine lines, pigmentation, tone and texture. It is ideal for patients desiring more than the typical microdermabrasion polishing process or light chemical peel. Halo™ is the pioneer Hybrid Fractional Laser treatment delivering dual wavelengths, both ablative and non-ablative. Laser treatments combining these wavelengths produce effective resurfacing results with faster healing time. Less painful than traditional resurfacing, Halo treats pigment issues, fine lines, wrinkles, scarring and pore size. 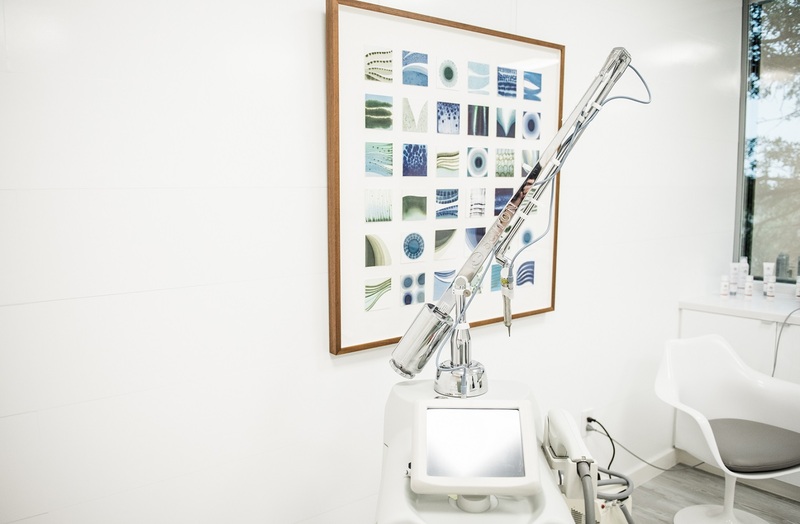 Each laser treatment is completely customizable to fit a patient’s needs. Contour TRL™ is recommended for the treatment of fine lines, deeper wrinkles, scars and pigmentation issues. It can also reduce lines around the lips and eyes. The Contour TRL is a tunable resurfacing laser. Like the MicroLaserPeel and Halo Fractional Laser, this laser treatment allows individual control of ablation depth and provides a customized patient experience. Recovery time may vary and is based upon type of laser and desired outcome. Your provider will discuss expectations and possible downtime during your consultation. With any laser treatment, avoid activities that may cause you to become hot for the first 24 hours including exercise, hot baths and/or showers, hot tubs and saunas. Two to three days of at-home recovery time is recommended because skin is more prone to irritants, pollutants and infection during this period. Unlike BBL/IPL treatments, makeup should be avoided for at least the first four days. Even if your skin does not feel warm to the touch, BBL/IPL treated skin will hold thermal heat for approximately 24 hours. Avoid activities that may cause you to become hot for the first 24 hours including exercise, hot baths and/or showers, hot tubs and saunas. In most cases, you can apply makeup and return to your daily routine immediately after a BBL/IPL treatment. The majority of patients will require approximately five treatments to reach their desired outcomes. Typically, you will see significant changes after the third treatment. Treated areas of the body are often more reactive than the facial area and may require extended downtime. Even if you have never had a skin procedure, it is a great first line of defense to combat premature aging. Always, skin should be protected with products recommended by your skin care specialist. Ready to address your skin’s problems? Call today for your consultation and renew your complexion with any of our laser treatments or IPL treatments.